Cyprus is a small island nation in the Mediterranean, one of the last divided countries in the World. This country is rich in history and culture that has divided the nation into Northern Cyprus, and Cyprus, which are Turkish controlled and Greek Cypriots. 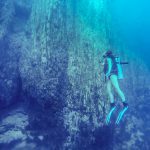 Cyprus is a popular beach destination in the summer for other European countries, but there is a lot more than just beaches. With stunning coastline, mountains, wineries, ancient sites, and two distinct cultures on one island, Cyprus is a perfect summer getaway. Mount Olympus, in the Troodos Mountains, at 6,404 feet (1,952m) is the highest point in Cyprus. Summer hiking, winter skiing, wine tasting and visiting some of the most historic Byzantine Churches are among the many things to do in the region. 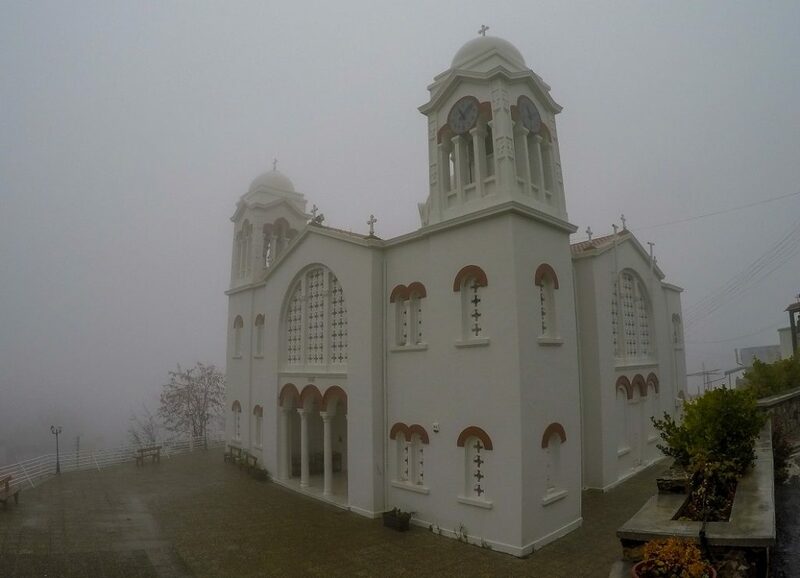 We recommend visiting the village of Kakopetria as well one of the most famous churches, the Pedoulas Church of Archangelos Michael. 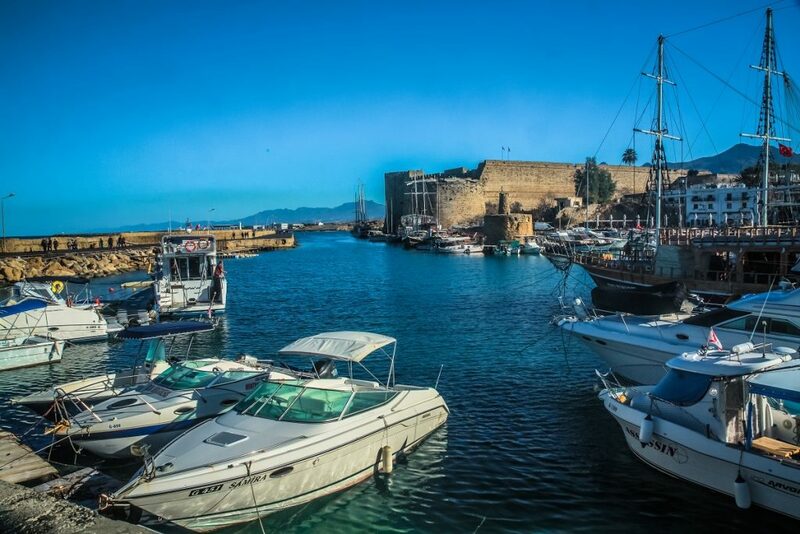 The Kyrenia is the main port town in Northern Cyprus. The old city has quaint cobblestone streets perfect for a sunset stroll. Check out one of the many ocean side restaurants for a seafood fix. Visiting a traditional Cypriot village is a must and Lefkara is one of the best. Located in the countryside, only forty minutes from Larnaca. 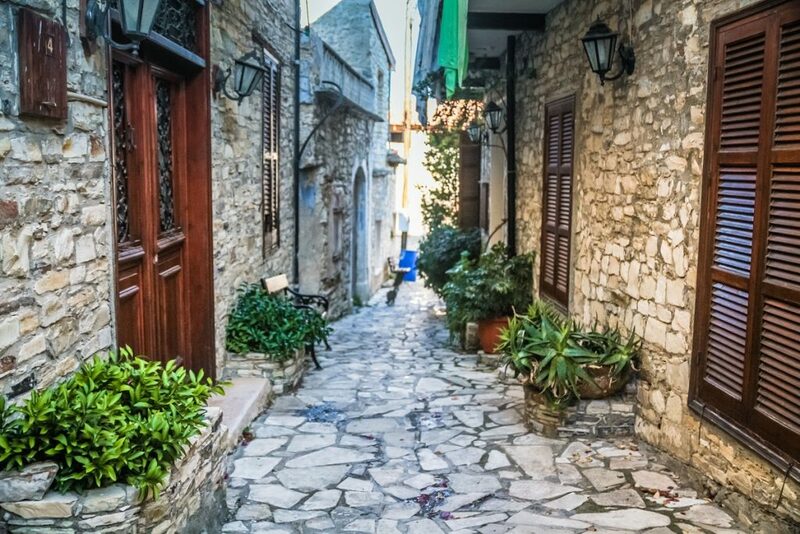 Lefkara has narrow cobblestone streets that maze throughout the village. While the village is small, Lefkara has a lot of charm. Pafos (or Paphos) is a large coastal city with a wonderful palm tree-lined promenade. 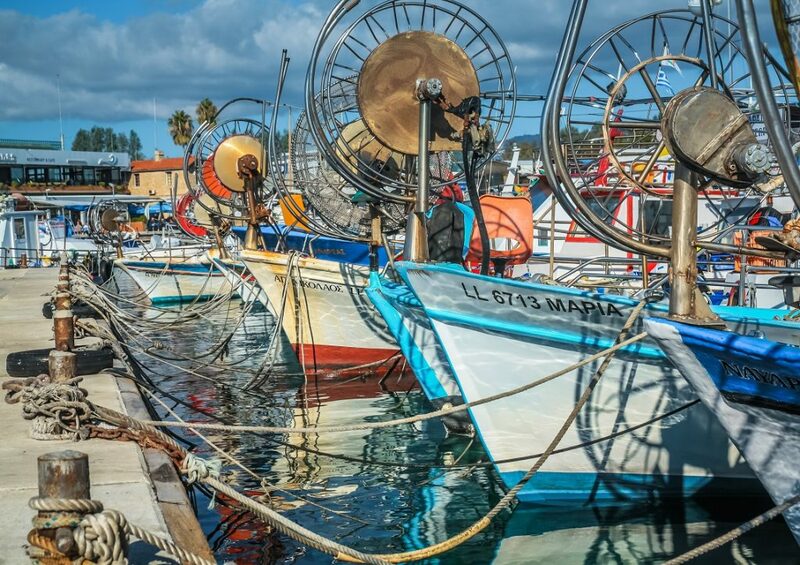 Loaded with cafés and seafood restaurants, several famous sites with ancient ruins, and popular beaches are among the reasons to visit Pafos. The Pafos Archealogical Park (€4.50) is just beside the castle and old city. The Tombs of the Kings (€2.50) is just a few kilometers outside of town. 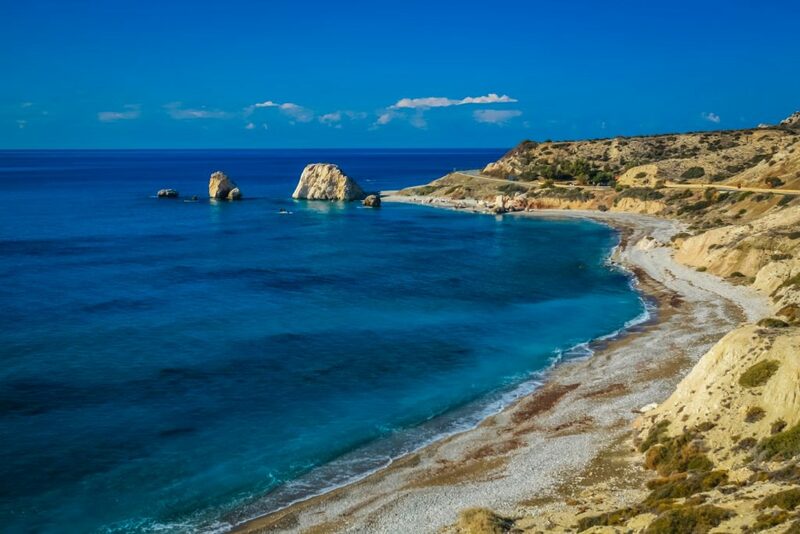 Among the many beaches in the area, Pafos Beach and Coral Bay were our favorites. 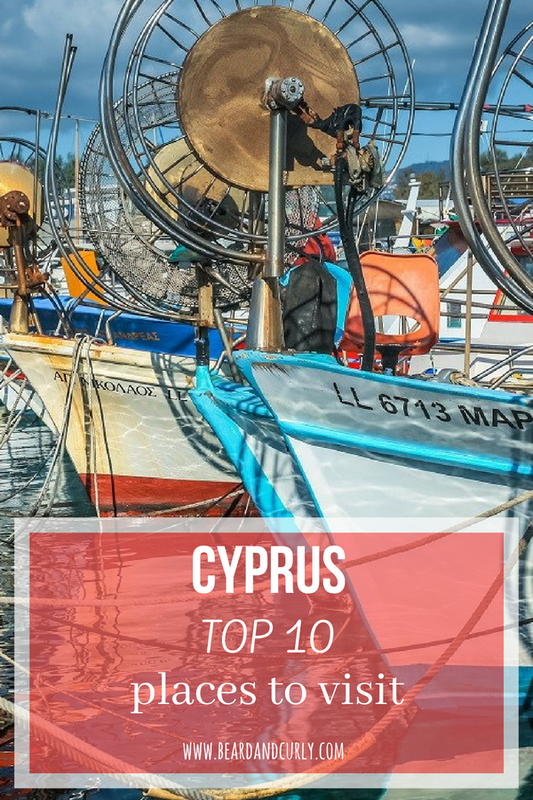 Cyprus is known for stunning beaches and Ayia Napa is home to some of the best. Ayia Napa is jam-packed in the summer with excellent nightlife and several beaches to choose from. 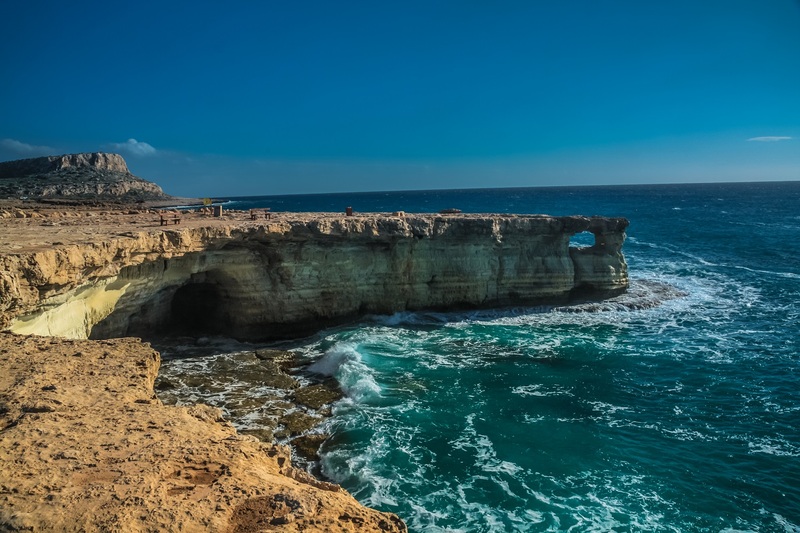 Limanaki Beach, Konnos Bay, and Nissi Beach are the best and don’t miss the natural Love Bridge. 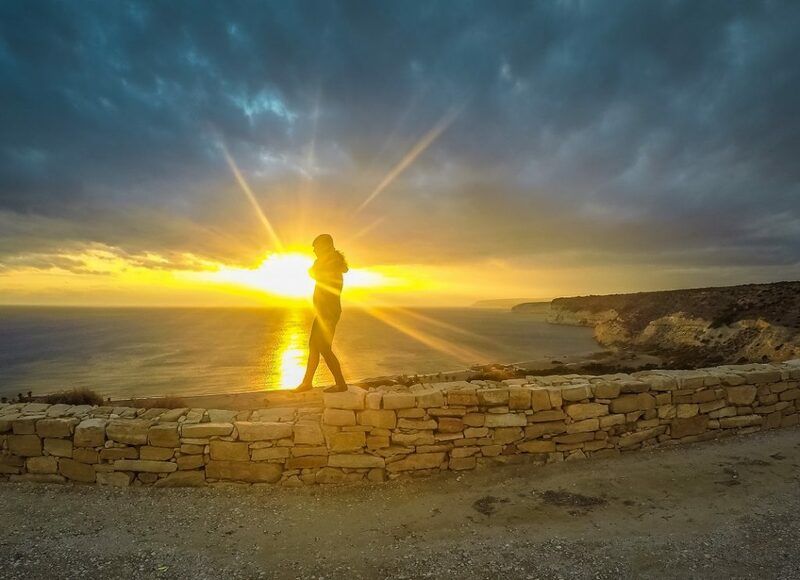 One of the more rugged coastal areas of Cyprus, Cape Greco has many scenic overlooks as well as walking trails. 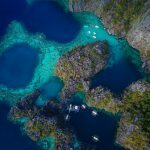 Don’t miss Agioi Anargyroi, the Stone Arch, the Blue Lagoon, and the Sea Caves. 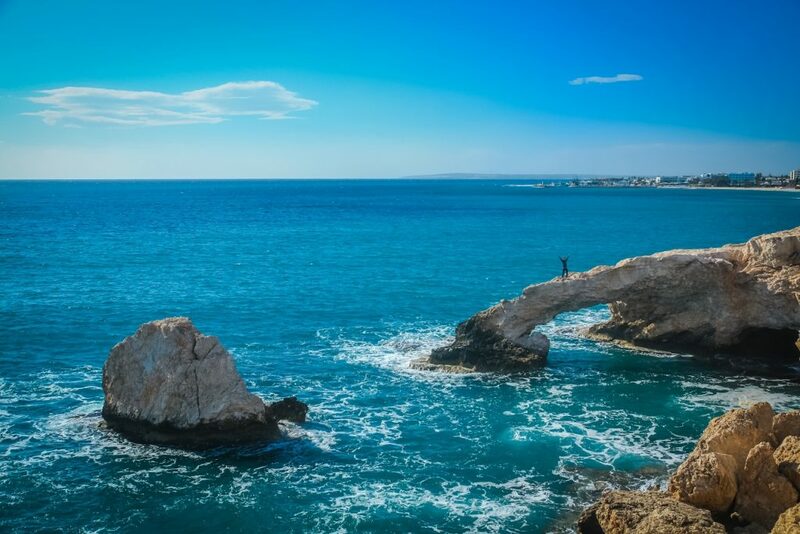 Aphrodites Rock, known as Petra tou Romiou, is a sea stack located just outside of Pafos. Mythology claims this rock as the birthplace of the goddess Aphrodite. The sea is rough, so swimming is not recommended. However, this beautiful spot and significance to Cypriots is a perfect stop when driving between Pafos and Limassol. Located near Limassol, the Kourion Ruins are one of our favorite sites in Cyprus. Dating back thousands of years, the Greek and Roman structures, arches, and amphitheater all have incredible views of the Mediterranean Sea. 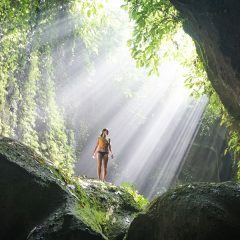 Entry to the ruins is E4.50 and free for students. 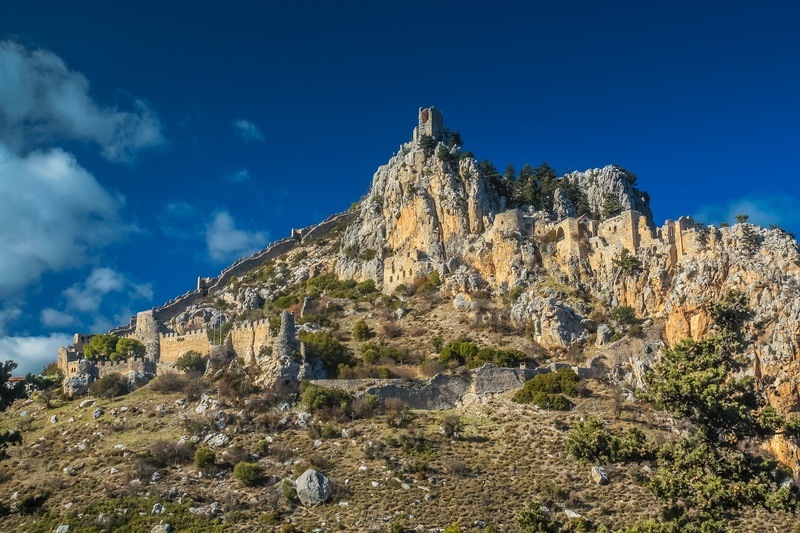 This Byzantine castle was originally built in the 10th century as a monastery and later fortified to protect the mountain pass between Kyrenia and Nicosia. Located in the Kyrenia mountain range in North Cyprus, this enormous castle is very well-preserved and comes with beautiful views of the Mediterranean coastline. Cost for entry is 9 Turkish Lira (€3). 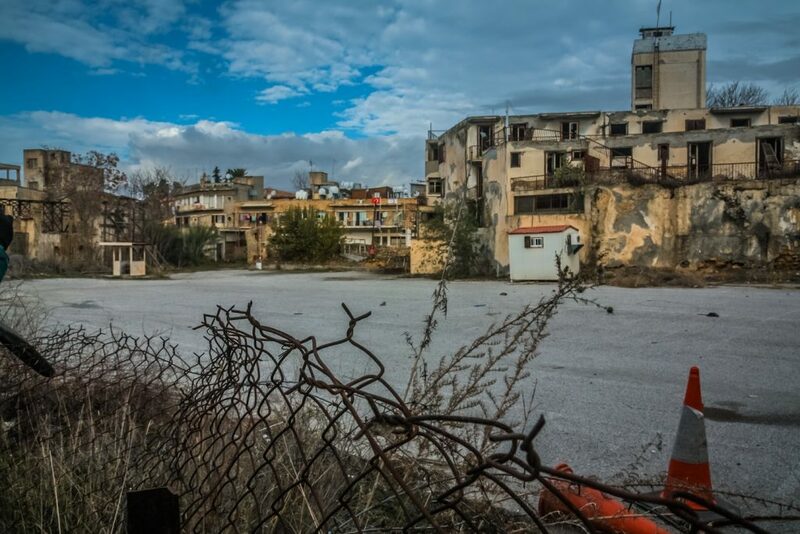 The largest city and capital of Cyprus, Nicosia is the last divided capital city in the world. The city has a UN Buffer Zone, aka the Green Line. The Green Line is not permitted to enter and heavily fortified, yet walking around the area shows an important part of Cyprus’ recent history. Ledra Street, the old town, the Buyuk Han and the Selimiye Mosque are the top attractions while visiting Nicosia. Ledra Street is the only crossing (pedestrian only) within the city. Photography of the Buffer Zone is illegal, so please do so with caution. We asked for permission on the Greek side and soldiers allowed us. However, be wary of the Turkish side taking pictures near the Buffer Zone. Driving from Cyprus to North Cyprus requires a border crossing. Most rental car companies do not allow cars in North Cyprus, but we took our chances. We loved our visit to the North, a vastly different experience. The main crossing is the Metehan Gate just outside of Nicosia. The crossing requires an international passport. Vehicle insurance is mandatory to buy at the border. Cost is €20 for three-day entry.